Owen Garvan has left the Richmond Park club having signed last July. Garvan joined the Saints last July. FORMER CRYSTAL PALACE and Ireland underage midfielder Owen Garvan has left St Patrick’s Athletic by mutual consent, the club announced on Tuesday. Garvan joined the club last July after spending over a decade playing in England with Ipswich Town, Palace, Millwall and Bolton. The 30-year-old returned to Ireland last summer following a two year stay at Colchester and was signed by the Saints mid-season in the midst of a relegation battle. Garvan made nine league appearances in 2017 as the club succeeded in staying up, playing an integral role in turning the side’s fortunes around in the second half of the season. 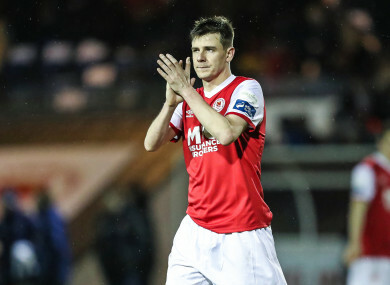 The player, however, has made just nine Premier Division appearances this year, not featuring for Liam Buckley’s side since a late substitute appearance on 16 April against Waterford. “Owen Garvan has left the club by mutual consent. We wish him well in the future,” the club said. The Dubliner spent five seasons on the books at Selhurst Park between 2010 and 2015, making 87 appearances. Email “Former Crystal Palace midfielder leaves St Pat's by mutual consent after 11 months”. Feedback on “Former Crystal Palace midfielder leaves St Pat's by mutual consent after 11 months”.